Winner of 3 Academy Awards, The Piano, starring Holly Hunter, Harvey Keitel, Sam Neill and Anna Paquin, is still as powerful and resolute now as when it was first released. 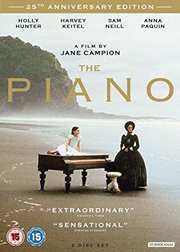 Ada -mute since birth- her nine-year-old daughter and her piano arrive to an arranged marriage in the remote bush of nineteenth century New Zealand. Of all her belongings her husband refuses to transport the piano and it is left behind on the beach. Unable to bear its certain destruction, Ada strikes a bargain with an illiterate tattooed neighbour. She may earn her piano back if she allows him to do certain things while she plays; one black key for every lesson. The arrangement draws all three deeper and deeper into a complex emotional, sexual bond remarkable for its naive passion and frightening disregard for limits.